Despite nearly 80% of the Bulls who played scored in double figures, the Bulls were unable to keep up. 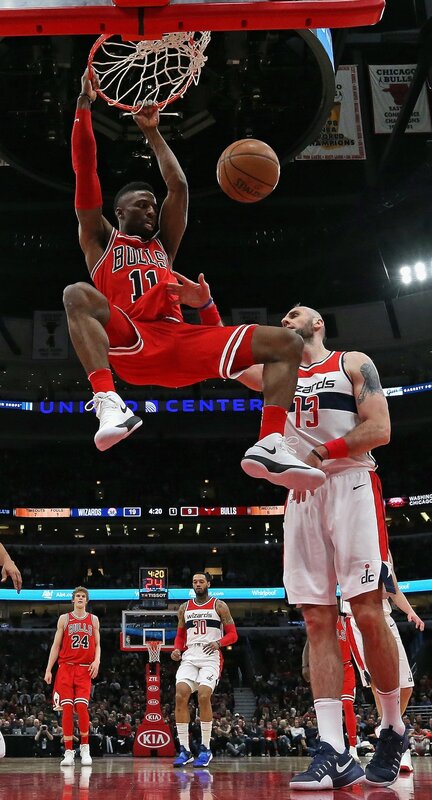 There wasn’t much wizardly to be found with either team Saturday in the United Center as the Washington Wizards defeated the Bulls 101-90. There also was no Zach LaVine and Kris Dunn for the Bulls, which was another problem. The Bulls looked like frozen ice fishermen after a long day to start the game after the fabulous win Friday night against Jimmy Butler and the Minnesota Timberwolves. The Wizards were basically without their All-Star backcourt, John Wall injured and Bradley Beal having his poorest game of the season, missing all seven of this threes and shooting three of 13 for seven points. The Bulls would, in effect, be taken out by Tomas Satoransky, the Czech mate who set a career high with 25 points, making 10 of 12 shots and five of six threes as the Bulls never really seemed to believe he was in the scouting report. And then Bobby Portis just took out Satoransky, Portis called for a flagrant foul 2 and ejected with 2:35 left in the game as Satoransky was driving baseline for a dunk. 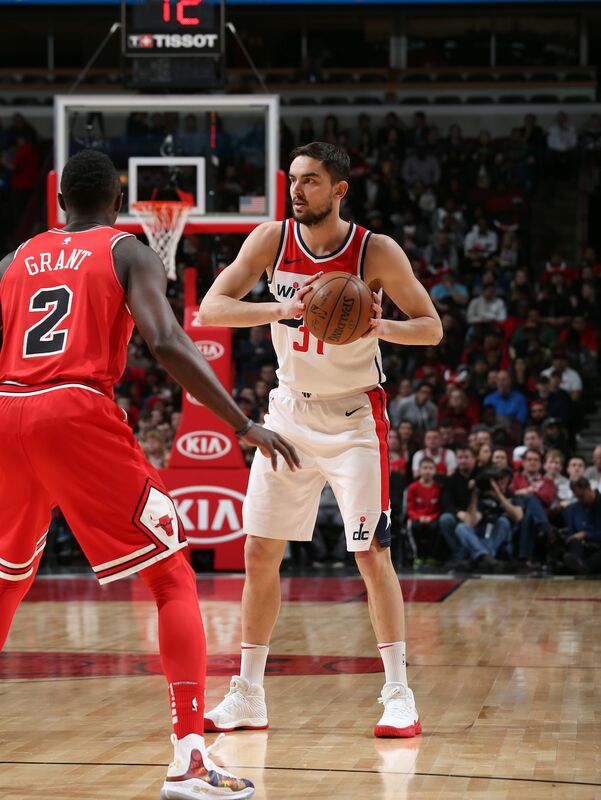 It didn’t much matter, at least for the final result if not for Satoransky’s health, as the Bulls were in the midst of the the last four minutes of the game failing to score a point in missing their last seven shots. It wasn’t unlike the start of the game when the Bulls missed five of their first six shots with a pair of turnovers, trailed 9-2 and never led again after their 2-0 start. It wasn’t happening on this night as the Bulls dropped to 19-36. Washington is 32-24. The Bulls had six players score in double figures led by Justin Holiday with just 15 points. Portis had 13. Lauri Markkanen, Robin Lopez and David Nwaba each had 12, Jerian Grant 11 and Denzel Valentine, starting for the resting LaVine, 10. LaVine isn’t playing the second of back to backs now as a precaution. Markkanen and Valentine had double/doubles with 10 rebounds each. Grant added eight assists and Holiday four steals. And that was it, it being Satoransky’s fifth three with 3:25 left for a 100-90 lead. Markkanen missed once more before the Wizards rebounded another Beal miss. Satoransky firing in along the left baseline got a pass and went for the dunk. Portis went for the ball (Bulls version). Portis took down Satoransky while he was off balance in the air (Washington and officials’ version). And the Bulls blended slowly into defeat. Satoransky was escorted to the locker room. The Wizards were farther away down there other end of the floor, which is perhaps why they saw it differently. That was the best news the Bulls might have heard after the game, though the emotional Wizards broadcasters were having none of it, screaming for Portis to be suspended. Remember, they get very emotional in Washington. Not so much in Chicago on this night; certainly not like Friday night, and not that much overall in a mostly pedestrian effort with a lot too many quick shots except for a nice sequence in the second quarter of multiple possessions with rebounds, head up and passes down court for scores. It really was the best and only true run for the Bulls in the game, a slick four minutes after the Bulls trailed 37-26 early in the second quarter. It was 30-22 Washington after one. That sequence with Valentine, Grant and Ryan Arcidiacono all making long, upcourt passes for scores enabled the Bulls to get within 45-43 with a Markkanen follow score. 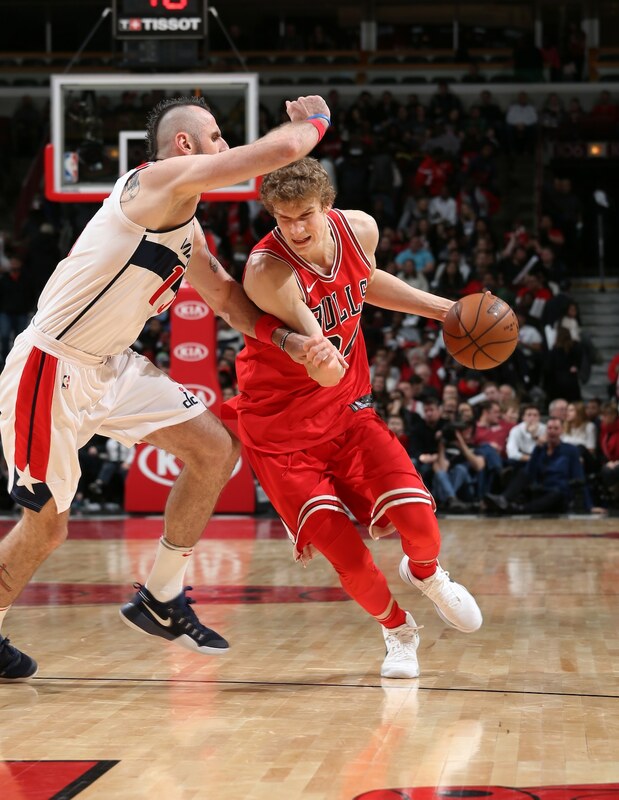 With Markkanen’s return Friday after missing three games with personal leave, there were questions about whether he was being ignored too much on offense. Hey, pick me, pick me, I know. The problem the Bulls have, especially without Dunn, who could return later this week, is the lack of point guard penetration where Markkanen can pop out for shots. LaVine had it going against Minnesota, and you would not want to break a run like that just to get Markkanen a few shots. Grant has played well, but he doesn’t particularly penetrate and pitch. And Holiday and Portis tend to shoot pretty much when they get the ball. There’s not a lot of ball movement without Dunn sometimes. Plus, Markkanen is unselfish and will move the ball. It just doesn’t seem to get back too often. Markkanen was an ugly five of 19 and one of eight on threes. But after not getting the ball the first eight minutes again it appeared he also began to force some shots. It’s a bit much to recover from with Markkanen missing with Dunn and LaVine missing, as it were. Sounds like Grant may have read the wrong scouting report since Satoransky is shooting 44 percent on threes this season. Though the Bulls did leave him alone on his threes most of the time. Well, he did have a point there there. The Wizards gathered after that second quarter Bulls play to take a 56-46 halftime lead. The Bulls going the next six possessions after that 45-43 mark with half turnovers and half misses didn’t work so well. Oh, Zach, where art thou? Lopez had an active third quarter that included his career high ninth technical foul for running to David Nwaba’s defense when he got into a little pushing thing with Mike Scott. You have to love that teammate. Still, the Bulls trailed 82-70 after three quarters when Portis went offensive again. He’d taken five straight shots early in the second quarter and then three of the Bulls first four to start the fourth. Hey, someone’s got to take those Nikola Mirotic quick ones. Washington also was scoring. The Bulls had that 11-2 run after trailing in the fourth by 16 to get within 97-90 with 4:12 left. Then came Markkanen’s miss and Portis not missing Satoransky. For what would be just the fourth time this season. That should be entertaining.